This series was highly recommended across so many outlets I added it to my TBR pile last year but for one reason or another it simply did not jump off the shelf to get read. Even though I had not read the book I actually recommended it to my daughter who had the same reaction that I did.. egh. This year the next installment is coming out and I'm sure I will hear everyone raving over the darn series once again and I'll be wondering what the hoopla is all about, so I was determined to read the darn thing!! I have consumed three doses of Singh's Psy-Changeling pairings since the beginning of the year and I'm actually quite hooked. To give you a bit of a background, the series takes place in an alternate universe where the races are subdivided between the humans, the Psy and the Changelings. Humans are easy to define, they are humans. Changelings can be divided into different categories depending on the animal they have the capacity to change into (wolf, leopards, jaguars, deers, hyenas, etc), and they all share that animals special trait (strong sense of smell, great night vision, speed, stealth, etc). They live in a pack like society and seldom relate to other packs, yet they share a common dislike for the Psy. The Psy is the top of the food chain. It is a race of beings who have had all traces of emotions wiped. They developed a conditioning called Silence which eradicates all feelings from the individual creating less emotion driven reactions in their culture. At first this was done to erase violent behavior that was triggered by uncontrolled emotions but they noticed that emotions could also affect their judgment in business and politics, so it became a society trait. To make this world a bit more complex, the Psy can also be sub-classified based on their additional 'gifts'. These designations can range from an M-Psy (healers/ scientist), F-Psy (foreseers), Tk-Psy (telekinesis), Tp-Psy (telepathic), E-Psy (empath), etc. When you have highly developed abilities you have a specific designation called Cardinals. If you are a Cardinal you are prized w/in the Psy society. The Psy are interconnected by the PsyNet where everyone's subconscious is linked in a Matrix-like environment which is governed by a council of Cardinals. The Council's word is law and they are not judged by any one. They make the decisions that rule this unusual society. Complicated enough? In an effort to save some time I'm going to give just a short run down of the three books I've read until now. Slave to Sensation (A) : The first in the series tells the story of Sascha Duncan, a Cardinal of the Psy world who is fighting an internal battle to hide the fact that her emotions are not as 'Silent' as they should be. She has been told all her life that she is 'flawed' and fears that if anyone discovers that she is actually 'feeling' she will be sent in for rehabilitation (which leaves the rehabilitated in a vegetative state). She is put in a more difficult position when she is put in charge of the first Psy-Changeling business venture and has to work closely with one of the most passionate men she has ever met. Lucas Hunter is on the prowl. The Alpha of the Dark River leopard pack is hunting a serial killer amongst the Psy and the business venture that brings a Psy Cardinal to his door is the best way to infiltrate the closely guarded ranks of the higher Council (Sascha's mother is a Council member). What he didn't expect was that the Psy in question feels more than she lets on and it doesn't take long before the alpha in Lucas wants to claim her as his own. When another female is abducted from the Snow Dancer's pack - a rival wolf changeling group, it become a race against time to discover who is the killer, who is covering for him and if the Psy Lucas has given his heart to can be trusted. There are some series that really don't need to be read in order. This one is not it. This book is essential to the whole storyline and those that are to follow. We not only get to see the strain between these two races in this book but the events that take place here open a subplot that carries on to all the other books. Similar to the J.R. Ward's Lessers and Kenyon's Dark Hunter plight. The Psy Council wants to be the last one standing and will do anything to stop the flow of information. Sascha needs to find a way to break away from the PsyNet to survive but if she does break free it will punctuate a severe flaw in the Net, one that opens the door for others to rebel. It is with this book that Singh introduces us to her world and those that inhabit it, promising us a wonderful ride into that Psy-Changeling world. 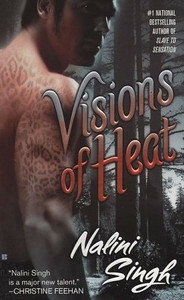 Visions of Heat (A) : This installment takes place a few months after Slave and follows Faith Nightstar as she struggles with similar feelings of instability as Sascha had but with the peculiarity that Faith expects insanity as her fate. As a foreseer (F-Psy) insanity is the final frontier - so to say. She is being considered for a post on the newly vacated seat in the Council but she is hiding the fact that she is seeing visions of death and torture instead of market gains and fluctuations (which is what the foreseers are used for since 'the Psy no longer have crime'). As her senses are very delicate she has lived most of her life in isolation and it is here that Vaughn finds her. Vaughn is a jaguar that joined the Dark River leopards after suffering a tragedy that marks his life. He has pledged his loyalty to Lucas and his fellow changelings. He is intrigued by Faith and feels drawn to her but he questions her motives in seeking help controlling her visions. The complexity in this relationship is what put meat on this book. Faith cannot withstand physical stimuli because it overwhelms her mental shields. To do so can lead to complete mental and physical breakdown, yet Vaughn pushes the edge of her boundaries over and over. He is determined to claim her as his own but he has to walk a fine line to extract her from the Psy world intact. And the Psy is not willing to give up Faith as easily as they did Sascha because Faith represents a strong flow of income. All this and another Psy murderer is on the lose but this time the victims are not a random selection but ones that make the killer feel threatened. I simply loved the push and pull Vaughn had with his 'Red' and Singh didn't bore us with another Psy disappearing from the Net, but figured a way to get Faith out of the Psy's reach in a very believable manner. Caressed by Ice (B+) : This one was a bit different. The Psy in question is already out of the PsyNet and he has been living as part of the Snow Dancer's pack for a while. Judd was an Arrow, an elite team of assassins, when part of the Net but he's family was marked for 'rehabilitation' when his sister killed herself showing signs of deteriorating conditioning. It was believed that the problem was genetic and every one of the Lauren's received a sentence of rehab. Judd was not amongst them due to his elite status he was not even acknowledged as a Lauren but he ran to protect his family, a weak sign as it is. the Laurens were the first to discover that the Psy could survive outside of the PsyNet if they can connect to another type of Net that could provide the neurological feedback that is needed for a Psy to function. Although he has been out side and part of the wolf pack for some time, he is really not accepted because he is not tactile. He refuses to break conditioning, but in many ways he does. He was part of the team that helped Sascha and Lucas bring down the Serial Killer in our first book and it's that female that brings him down. Brenna was violated in the most horrendous manner for a Changeling. She had her mind raped and her body tortured to a point where she was barely functional when finally rescued, but she has fought her way back. Now there has been a murder in the Den. She had seen the murder take place in her dreams, it made her part of the killer and the death simulates what had been done to her. She finds that the only person that can keep the demons away is Judd. His cold nature does not sugar coat anything for her, but it infuriates the wolf in her. This book was very closely tied tot he first two books. Judd had some serious issues because he was not only mentally programed in Silence but he was physically attached tot he conditioning where shards of pain would be sent to his body every time he felt anything outside of Silence. He also had a problem WANTING to break Silence because his particular 'abilities' could have him kill without really wanting to. If he felt anger too strongly, or felt any negative emotions he could inadvertently kill who ever was close by. The book itself was slow at the get go but when Judd started to give in to Brenna's insistence the story just took off! There is a lot of development of the subplot here, a lot of foundation put in place for the next few installments of the series so you really can't miss these first few books. I'm getting ready to start the fourth book Mine to Posses and then Hostage to Pleasure. This will bring me up to date with the series and prepare me for the release of Branded by Fire, a cross over between the Snow Dancer wolf pack and the Dark River leopards, coming out this July. This month the AOM for my yahoo reading group pushed the edges of Romance and made me step into a realm I don’t typically read. There is a big difference between the sci-fi aspects of a book like Justin Davis’ Sky Pirate and Lois McMasters Bujold’s Vorkosigan series. One is focused on the romance and the other has the romance squeezed into the story. 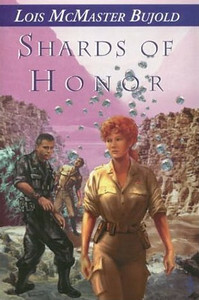 Shards of Honor is not well known outside of the Sci-fi genre just because the books that followed quite overshadowed this one. It is better known as the first part of the omnibus that is Cordelia’s Honor. This installment tells the story of how the parents of Miles Vorkosigan (the hero of the series) met and fell in love. Cordelia Naismith is commanding a scientific expedition from Beta Colony on a newly discovered planet when her team is attacked by Barrayarans. She finds herself captured by Aral Vorkosigan, better known as the Butcher of Komarr. She later discovers that the attack was mostly for his sake and that there is a plot to get rid of the honorable warrior. Aral has molded himself from the environment he has lived in and has sharpened his teeth on the political intrigue that has surrounded his planet. He is a strategist and has no patient for those he perceives as weak. In Cordelia his assumptions are put to the test and his beliefs challenged when he discovers her strength and moral values, something unexpected among her race. These two have been stranded on this new planet and without being able to trust anyone, they must rely on each other to get out of the dangerous situation they find themselves in. This trust serves as a foundation to the relationship they develop and need to survive, not just the trek to safety but the ensuing political plotting on both ends of their race (but mostly on Barrayar). For such a short book it did hold quite a bang and a lot of things were squeezed into its pages. I think I need to re-read the book because even though I got the gist of it, I think I missed a bit. So many things kept going on and the time line of events kept jumping forward that it was hard to grasp how much time had elapsed between one event and the other. And yet the book was very satisfying, very engaging and opens you up to want to find out what else is going to happen. I have been thinking about this for the last couple of days and finally thought I'd put it out there. I have been having a another great month in February with only half the month gone by and 11 books under my belt. The amazing thing is that many of the books have been actually wonderful reads. I think I have 5 books with A's and just a few in the C's. So it's not like I'm not enjoying what I read and yet I feel I'm missing something. I feel I'm looking for that next great read. Have you ever felt that way? You are enjoying what you are reading but you know that it will not be a story to haunt you for years to come. It is not an automatic classic in your eyes. The last book I read that will stick with me for a VERY long time was "The Host by Stephenie Meyer". 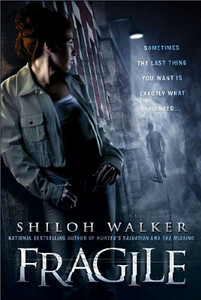 Yeah, she has become almost a cliche for her Twilight series (You either love her series or you hate it - and I loved that series) but her venture into adult fiction was what solidified her for me. She just did it for me. Her Wanderer, searching for her own place among the friends and family of her host, her loyalty to Mel and her selflessness will be with me for a long time. I recently read Wicked Lovely by Melissa Marr and although the book gardnered an A it did not impact me the way I wanted it to. Yes, it's a must read. Yes, the characters left me wide open for more. Yes, I already have Ink Exchange (the sequel) on my iPod for reading but I feel myself still searching for that next great book. I honestly think I'm addicted to the rush I get when I'm in the middle of a book and discover that this one is it! This is the great read. This is the one I can talk about until I'm blue in the face and still be excited over it. The one I have to curb the urge to buy three or four copies and send them out into the world so that everyone can read it. So.. With that said... Have you found your next great book? If you have, can you share it with me? I think if I don't get a fix soon I'm going to go into withdrawal. Have you seen the Pretty Cover? It’s not so much that the cover is the coolest cover out there, it’s the fact that this cover is for the new Jamie and Claire book. Yes!!! Can you hear me squeal in delight! 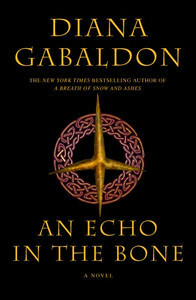 Ms. Gabaldon recently posted the US cover on her blog and I had to share. Amazon has a tentative (I try to focus on this part so I won’t be too disappointed if it gets pushed back) date of September 22nd for the publishing of this new installment of Diana Gabaldon's Outlander series. It’s been too long since we have heard from Jamie and Claire. I miss them terribly! On a side note and while we are the topic of the Outlander series… My wonderful sister Brenda bought me the first two installments in Audio! Yes, I have the CDs. Yes, I can listen to Davina Porter bring my favorite all time characters to life WHENEVER I WANT!!! So now back to Echo … keep your fingers crossed for publication this year. Send Gabaldon good vibes. Last month I had a great reading month but I honestly had a terrible blogging month. I have been remiss on my reviews for the last few months and I will admit that November and December were due to work and the holidays but January gives me no excuses. So, I'm determined to put in at least 5 posts per month from this point forward. So let's start with a new release from one of my favorite authors. Fragile arrived at a bookstore near you on the 3rd of February. I was fortunate to receive an ARC which let me read it in January. and before I go on... Don't you just love that cover! Fragile tells the story of Devon Manning, a social worker who is struggling to keep her head above water. She carries a dark past which makes her push away those that wish to develop any type of relationship with her. Devon was orphaned at a young age and put in the care of her Aunt who was not much of a care giver. She was abused by her Aunt's boyfriend and eventually kicked out of the house. By the age of 13 she was an addict headed on the road to nowhere. She was 'saved' so to say by a social worker that cared enough to look past the façade that she had put up. This inspires Devon to follow in that work, to be that one person that stands between a battered child and a system with too many cracks. She spends a lot of her time in the hospital rescuing those children. And it is there that she meets Luke. Luke is looking for something. He has not been able to put his finger on what is missing in his life but he knows that he needs to find it soon. His life was never one of distress but he surrounds himself by those that need rescuing, especially his twin brother, Quinn, who had the unfortunate luck to have been raised by their alcoholic mother. She stole him from the hospital after birth, leaving a weaker Luke in the care of his father. Luke has stayed close to Quinn since he came back into their lives at the age of 11, but after Luke gets injured in the armed forces they head their separate ways. Luke finds military life empty and seeks meaning to his life, so he studies medicine and becomes a doctor. Luke falls hard for Devon and she allows him to creep into her life. They develop a fragile relationship where Luke gets to play the role of hero and Devon gets face some of the fears she has been holding onto for most of her adult life. If you think that this is where the story lies you would be wrong. The meat of the story lies in the suspenseful thriller that takes front and center by the middle of the book. Devon's work leaves her open to many people that might carry a grudge. Not every one appreciates some one meddling in how you raise your child, especially those with the propensity for abuse. This is why no one really pays much attention when she develops the attention of a stalker. No one that is, except Luke, who has the feeling this is more than just a disgruntled parent looking for payback. The suspense is strong and when you think you know who's done it… you need to guess again. Walker brings her talent for angst to the pages of this book but I think there was too much misdirection to keep me from being blown away as I was with The Missing. The most flawed / damaged of all the characters was the one that attracted me the most. Luke was very much the man who wanted to solve everyone’s problem, his super hero attitude pulled me away from really caring for him. It could be that I felt he wanted to take over Devon’s life in the guise of protection. Devon had much baggage but she was holding her own. Her background gives her the characteristics of a strong female and the beginning of the story gives us a glimpse of that person – when she opens up to Luke and lets him in, but as the story moves forward she becomes just an image of the woman she was. There is an explanation for her 180 at the end of the story but we don’t get the chance to justify her behavior and get our feelings in check before then. It made me lose my admiration for her character and the explanation at the end was not enough to pull me back to my original opinion of her. I also thought that the villain really came out of no where. I know that it would have killed the suspense but I felt we were being pushed into one direction and then forced into another at the last minute. If you are driving a car and try a maneuver like that, you just might fall off of a cliff. Regardless of these 'weaknesses' the book kept me glued to its pages, it made me really think about these characters and what I expected from each one. It made me question my judgment on each and every one. I was never sure if I really knew the character or if I was being led on a merry chase. Walker recently announced (see her post here) that she would be writing romantic suspense for Ballantine Publishing. I think this is definitely right up her alley. She can definitely keep you on the edge of your seat, turning the pages to uncover the true villain of the tale. If you haven’t already picked up Fragile, don’t miss out, it will have your heart pumping until the very end.